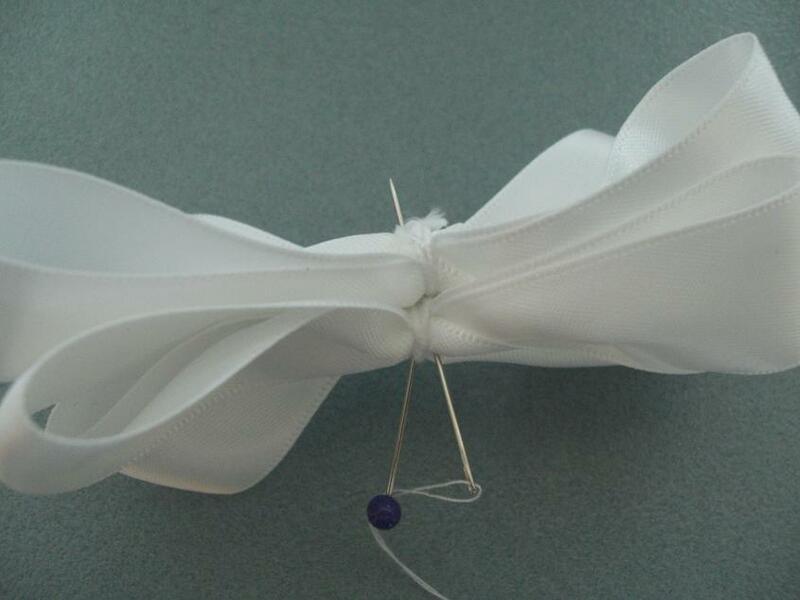 Home » How to make » How to make a basic boutique bow. 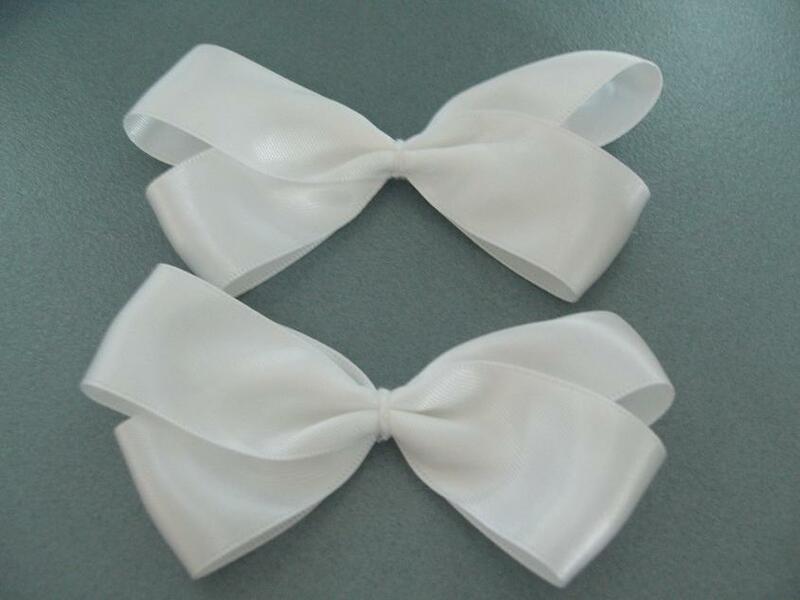 We are going to make a double layered basic boutique bow. 1 length 50cm. Heat seal the ends with a lighter candle, if making a lot you my find it quicker to use a heat cutting tool. Take the 45cm length and fold in half and crease the fold with your finger. Fold in half again and finger crease the fold as before. 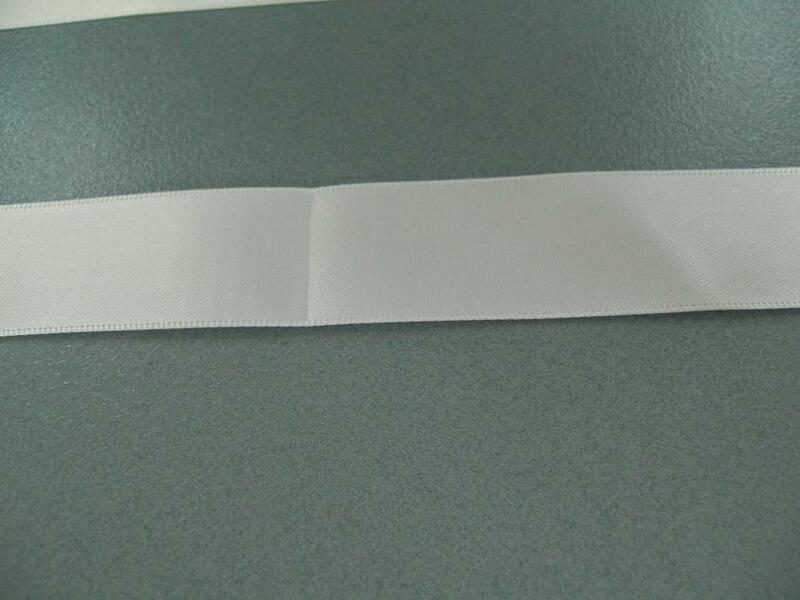 Open your ribbon and you will have 3 fold marks. These will be your guide. I take my right side crease and fold it so it sits over the centre crease than fold the left side crease over the centre crease. I make the angle of the creases sit at about 45 Degrees to the centre crease and pin the centre. Your bow will look as the below photo. I don’t think it matters if you fold left to right. I am right handed if you are left handed it might feel easier to go left to right. Now I pull up my left side edge and over lap the crease about 1cm, than right side and sit at 45 degrees and pin. This will make the bottom bow a little shorter than the top. If you want them the same size. 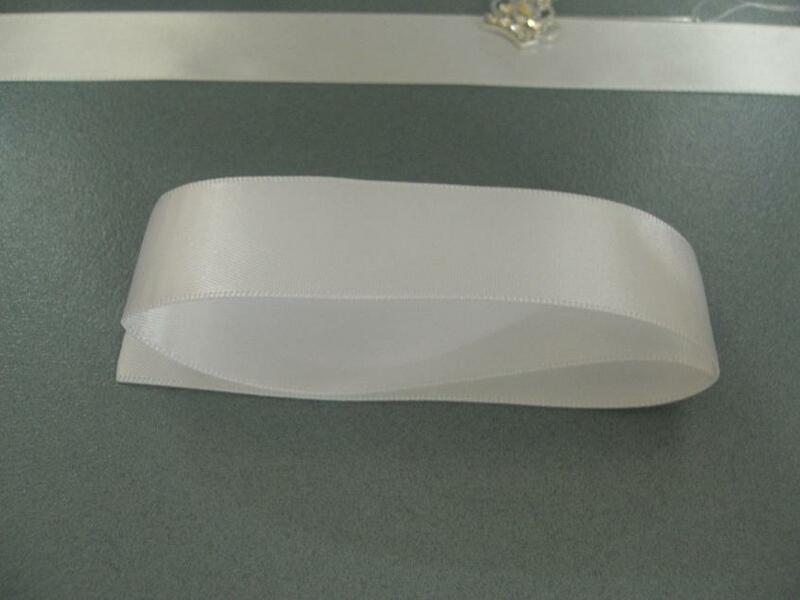 Fold your ribbon in half and than when you fold in half the second time leave a 1cm from the edge and fold and crease. 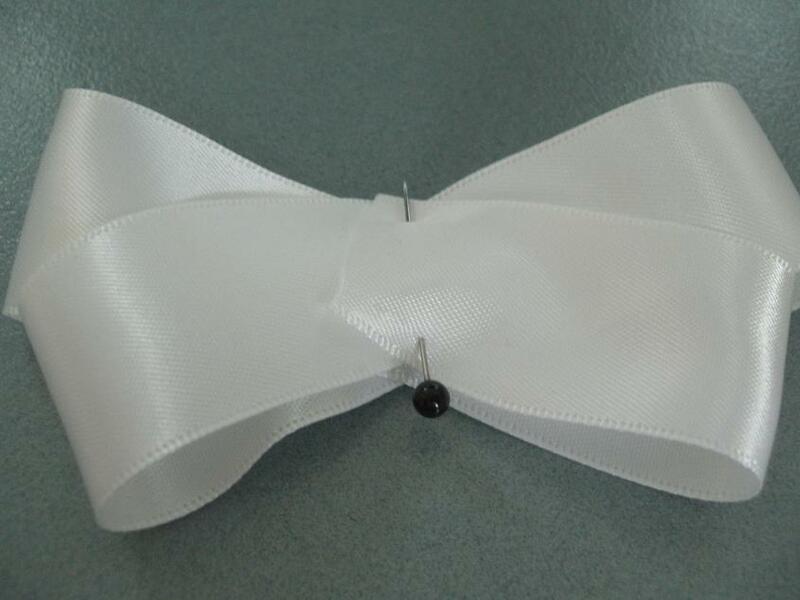 This is the top side of your bow with the pin in. Have your needle threaded with knot ready. I than hold the bow as below. I than pull out my pin and pick up the needle and stitch it as below. Do not pull your needle all the way though. With right side up I take my crochet thread and wrap it around the needle so the thread sits on opposite sides of the needle. Do a double knot and pull. 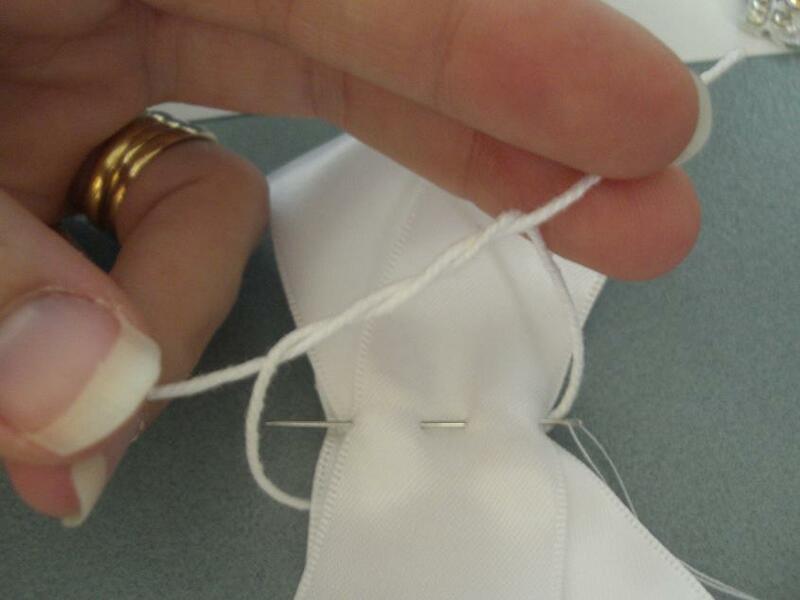 Turn the bow over and repeat on the back and than do a single knot and cut of extra thread. 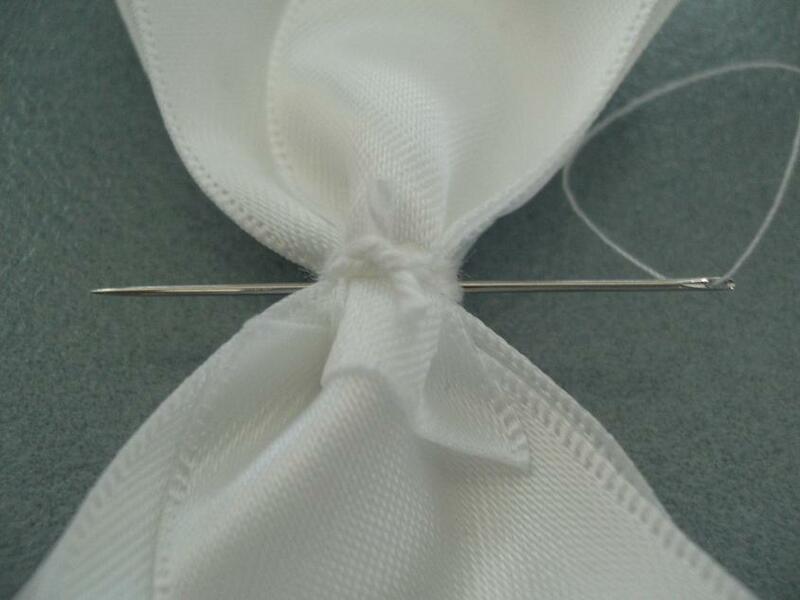 I than pull the needle through wrap around the bow and tie off. 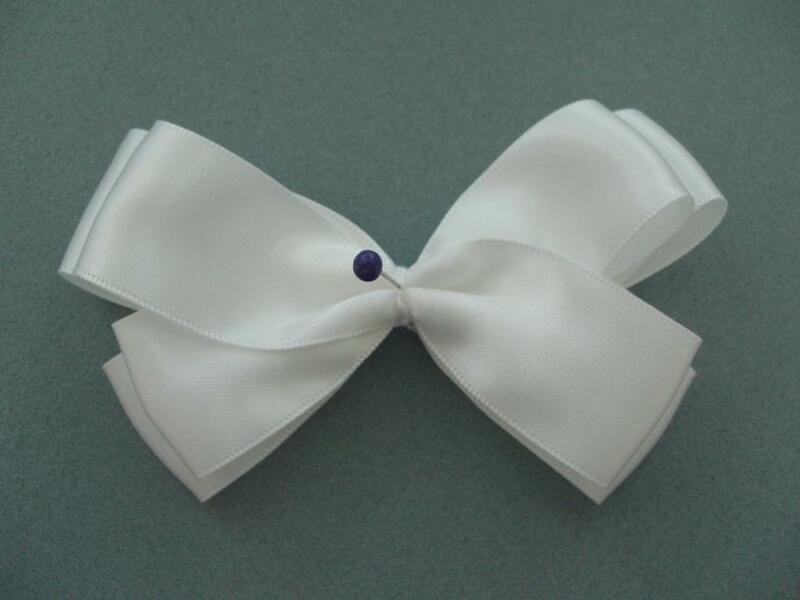 You know have 1 basic boutique bow. Take the 50cm length and repeat the above steps. 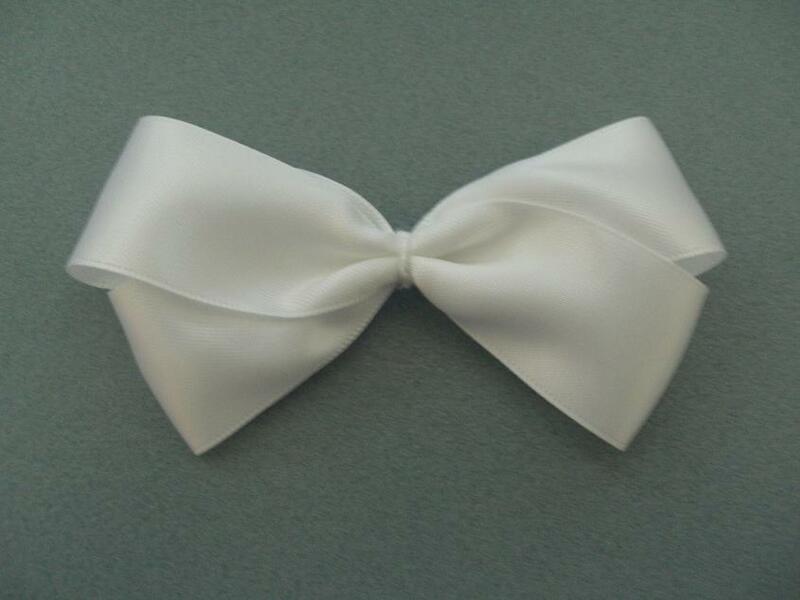 You will now have 2 basic boutique bows. 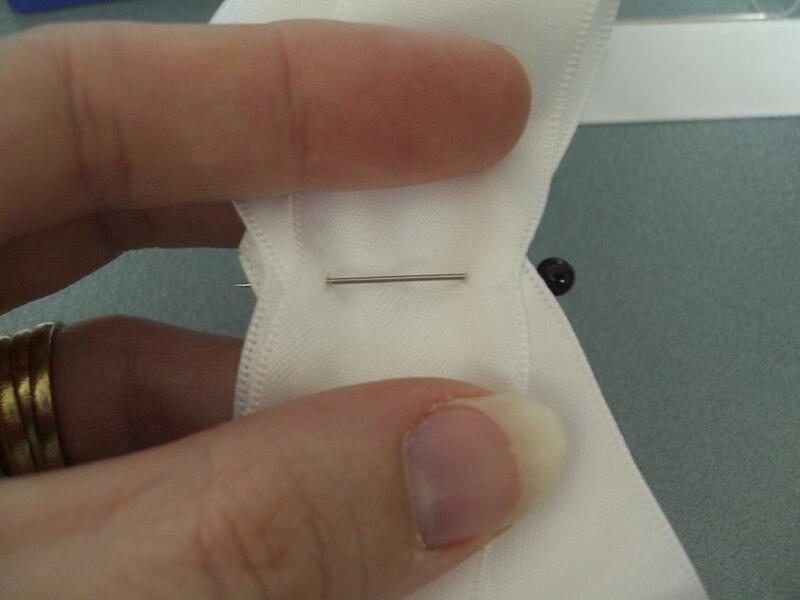 Place the smaller bow on top and centre it. I use a pin to hold in place. 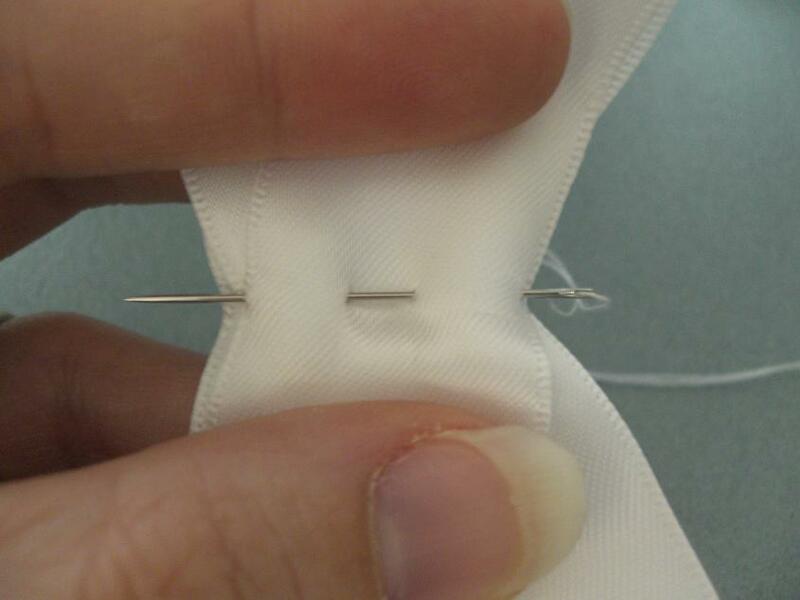 With the pin holding in place a push through a threaded needle and stitch in place. You can just hot glue them together. 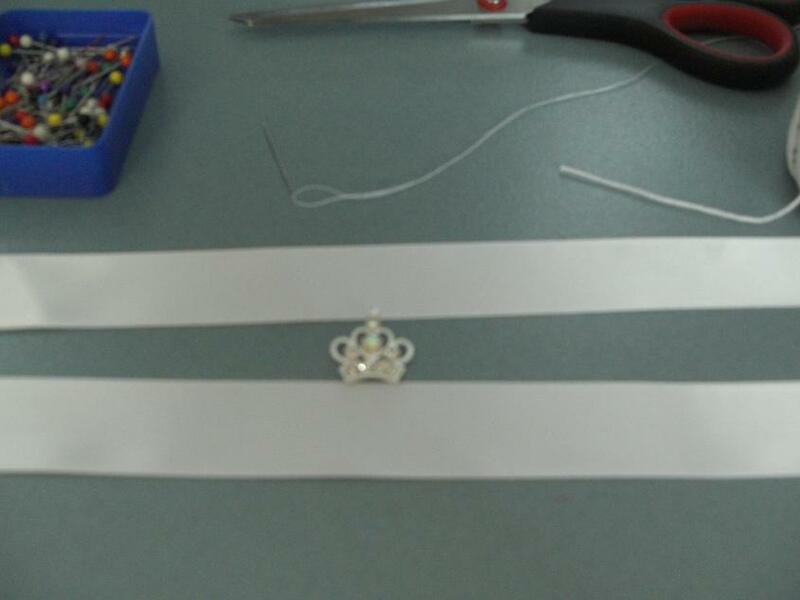 You can just hot glue a length of 9mm ribbon around the centre to finish. 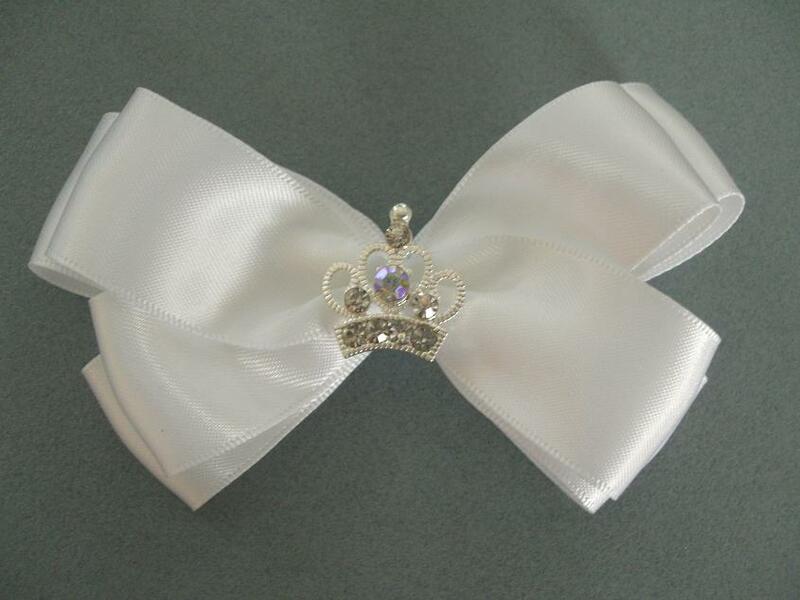 I have add some bling with our rhinestone crown embellishment. Thank you for taking the time to read my tutorial. If you would like to share please use a link to our page. 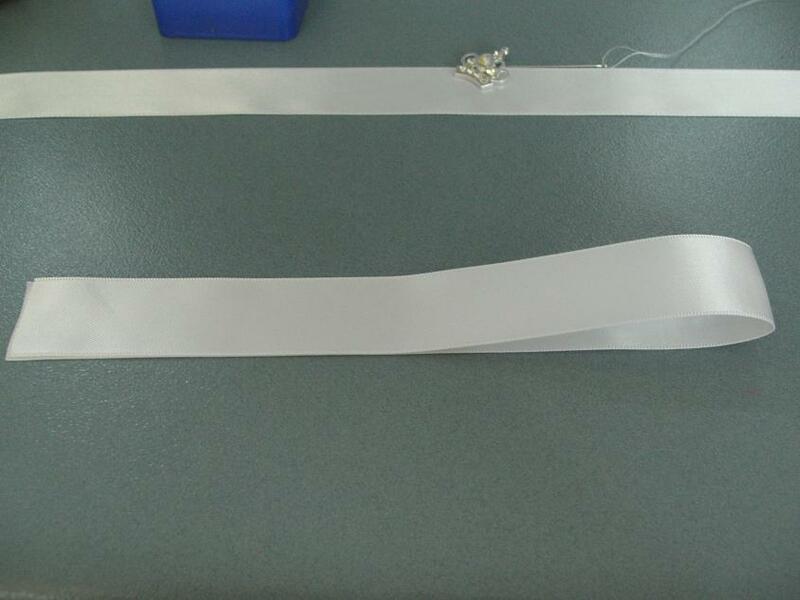 Looking for craft supplies in Australia see our website Think Bowtique for a large range of ribbons, elastic’s, flowers and embellishments. ← Shabby chiffon flower giveaway with Think Bowtique.